A night of wildfire-induced terror in Napa has given way to a morning hellscape. Unchecked fires raged through five northern California counties overnight on Sunday, incinerating an as yet uncounted number of structures, forcing harrowing hospital evacuations and burning tens of thousands of acres. Napa and Sonoma counties were the hardest hit, according to SF Gate, with residents forced to flee in the middle of the night. 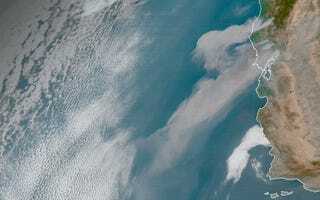 Ash fell from the sky on Monday morning, while a blood red dawn spread over a Bay Area blanketed in smoke. The conflagrations are the latest in what’s shaping up to be one of the worst wildfire seasons on record for the U.S. and North America as a whole. Climate change is already helping to make large, destructive fires more common, and the trend will only become more pronounced as the world continues to warm. The Tubbs Fire is the largest of the wildfires currently burning, blowing up from 200 to at least 20,000 acres on Sunday. It led to mandatory evacuations in Santa Rosa, a city of 175,000 about an hour north of San Francisco. Residents reported seeing homes, restaurants and shops on fire as they fled, according to SF Gate. Two hospitals in Santa Rosa were also evacuated, and Sonoma County has declared that both are non-operational as of Monday morning. As the sun rose on Monday morning, ash was seen falling from the sky up to 60 miles away. Early risers in the Bay Area were greeted by the acrid sting of smoke and a technicolor sunrise, a scene that’s become eerily familiar across the West this wildfire season. Officials are still investigating the cause, according to the Los Angeles Times. Steve Bowen, a meteorologist with Aon Benfield, tweeted that increased vegetation growth during the wet winter followed by a much drier than normal summer meant there was a lot fuel to burn. 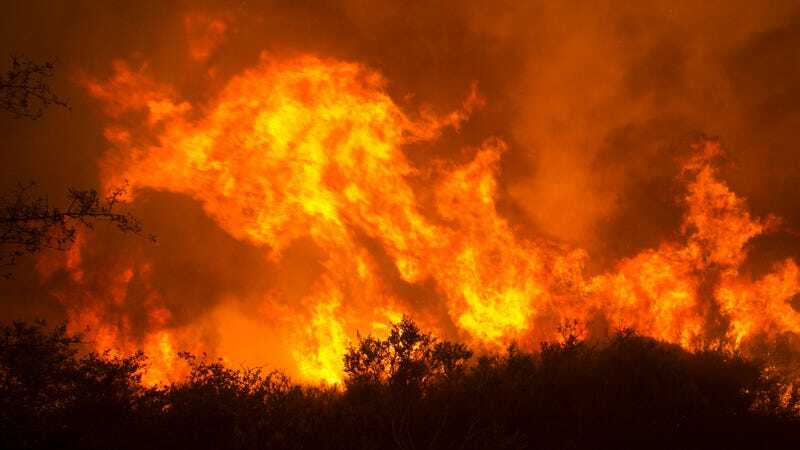 Anthony Westerling, a fire expert at the University of California, Merced, said that the current flareup is not that unusual for this time of year in the region compared to recent decades. But these fires are part of what’s becoming an extraordinary (and not in a good way) wildfire season for the West. The region has seen 8.5 million acres burn so far this year, well above the 10-year average of 6 million acres. Large fires have raged across Montana, Oregon, Idaho and, well, basically every western state this summer. Canada has also been ablaze, with 3 million acres seared in British Columbia alone. Fires there sent smoke cascading across the West and even all the way to the Arctic and Europe. Destructive wildfire seasons like this one are becoming more common. Years of wildfire suppression has left forests overgrown and primed to burn. Humans are also starting more wildfires than ever before. Then there’s climate change, which is becoming an overwhelming driver of the fiery fate befalling forests. The West has warmed nearly 2°F since 1980. That’s drying out trees, shrubs and grasses and creating more fuel for explosive wildfires. Since 1970, the number of large wildfires has doubled across the West. Rising temperatures also mean that wildfire season stretches 105 days longer, according to a Climate Central analysis. The continued rise of temperatures will only make things worse. For every 1.8°F increase in temperature, the western U.S. could see a quadrupling of the area burned by wildfires according to a National Resource Council report. Update, Oct. 9 4:11pm: The fires that blazed through Northern California last night and today will go down as some of the most destructive in state history. At least 1,500 structures have been destroyed. That combined total would rank as the fifth-most destructive fire in state history—and the blazes are nowhere near being contained. The blazes have burned more than 57,000 acres. At least 45,000 are without power and/or cell service according to the Los Angeles Times. Somehow miraculously, there have been no reported deaths yet. Governor Jerry Brown has declared the area a disaster zone. Oh, and Southern California is ablaze as well. A fire in Anaheim Hills quickly spread out of control, pushed along by strong Santa Ana winds. Schools and homes were evacuated and early reports indicate at least some buildings have burned to the ground or sustained damage. Gusty winds are expected again on Tuesday, creating challenging conditions for firefighters. Update, Oct. 10 12:15pm: The news from Napa and Sonoma keeps getting worse. Officials report that 11 are dead and 150 are still missing. Wildfires have burned up to 119,000 acres, which makes this one of the top 20 biggest wildfire events in California’s history. And with at least 1,500 structures destroyed, this outbreak will be at least the fifth-most destructive fire in the history of the Golden State. The slight bit of good news is that windy conditions will die down today, allowing firefighters to get a handle on the blazes. But the risk of weather conducive to wildfires ticks up again tomorrow, which could create further destruction.